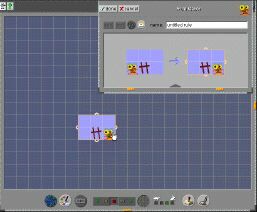 Stagecast CreatorTM is a program that allows adults and children as young as 8 to build their own simulations and games, and to publish them on the World Wide Web. Authors create characters and show them how to change and move. The characters can be made to do different things depending on what other objects are around them. Creator was invented by Allen Cypher and David Canfield Smith in the Advanced Technology Group at Apple Computer. It was originally called KidSim and then Cocoa. Watch a movie showing how to create your own world in Stagecast Creator. "Building Personal Tools by Programming"
In Communications of the ACM, 43(8), August 2000, pp.92-95. "Novice Programming Comes of Age"
In Communications of the ACM, 43(3), March 2000, pp. 75-81. "Making Programming Easier for Children"
In Druin A., ed. The Design of Children's Technology, Morgan Kaufmann, San Francisco, 1998. "Degrees of Comprehension: Children's Understanding of a Visual Programming Environment"
In Proceedings of CHI, 1997 (Atlanta, March 22-27). ACM, New York, 1997, pp. 351-358. "Collaboration and Discourse While Programming the KidSim Microworld Simulation"
In Computers and Education, 26, 1996, pp. 143-151. David C.Smith, Allen Cypher and Kurt Schmucker. Interactions, ACM, 3(5), Sept.-Oct. 1996, pp.58-67. "KidSim: End User Programming of Simulations"
In Proceedings of the Imagina '95 Conference, Monte-Carlo, February 1995, pp. 87-99. "Learning graphical programming: An evaluation of KidSim"
In Nordby, K., Helmersen, P.H., Gilmore, D.J. & Arnesen, S. A. (Eds). Human-Computer Interaction: Interact'95. London: Chapman & Hall, pp. 145-150. "KidSim: Programming Agents Without a Programming Language"
In Communications of the ACM , 37(7), July 1994, pp. 54 - 67.